Last Post for this Decade! (was that a bit too dramatic :) lol! Can you believe that this is the last day of this whole decade and that a whole new decade is opening up tomorrow (or in some parts of the world - it already has!) Well, I am busing writing down my New Year's Resolutions and trying to make sure I can actually do it for the whole year - and maybe a whole decade! Are you getting ready for some New Year's Eve fun? What are your plans? I think we are going to do something simple with some friends and one of my favorite traditions is to re-read my journal entries from the past year and write down all of my resolutions for the new year in my brand new journal :) - its such a great way for some introspection and a great way to wake up tomorrow with a feeling of freshness, newness, hope and gratitude! 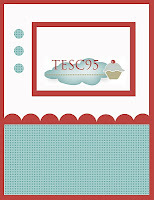 Today I am also the hostess for the Stamp a Sweet Impression blog for Taylored Expressions today - where I created a little Framed Fridge magnet - it is one of my New Year's resolution to de-clutter our house - and I thought I would start with our fridge (one of the main places that our clutter seems to be drawn to like magnets ;). Thank you dear friends for visiting my blog today! Before you head out into cyberspace - I just wanted to wish each of you the happiest of New Year's and that it is filled with love, laughter, joy, bliss, fulfilled dreams, being with your loved ones, prosperity and deep contentment!!!! Cheers to an amazing New Decade!!!!!!! 2010 - here we comeeeeeeeeee!!!! I had a lot of fun making this card and the whole time I was thinking about all of my New Year's Resolutions for next year - and how to make them last longer than 4 days!!! lol! 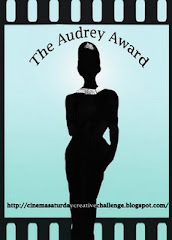 I hope you all have a chance to play along with this totally fun challenge! And stop by 2 Sketches 4 You for more details and to see all the amazing creations from the Design Team! Hope you are all cozy and tucked away with your loved ones on this Christmas day! We are with spending time with family and are enjoying a White Christmas as the snow still falls and the piles up outside! Perfect for hot cocoa and sugar cookies ;) and to build snowmen later! 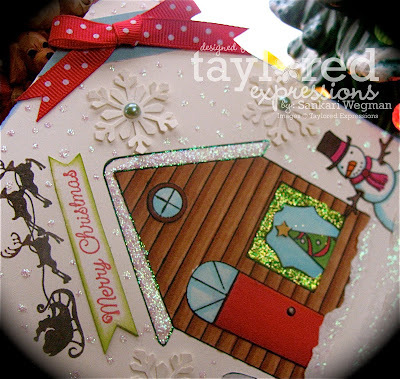 Here is a Christmas card with one of my fave sets: Holiday Wonder from Taylored Expressions - I was inspired by all the snow we were having and decided for a white on white kind of card with some glitter (can't go wrong with glitter :) Can you see all the snow falling outside? 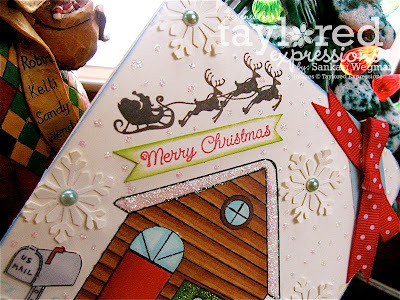 Accessories: snowflake punch from Martha, pearls from Kaiser, stickles, ribbon from stash, corner rounder/chomper and copics. I hope that you are all enjoying time with family and loved ones! Wishing you all joy and love!! Hope you are having a relaxing and wonderful start to your Monday! Accessories: dimensionals, Martha Stewart punch, bling from stash, ribbon from stash. 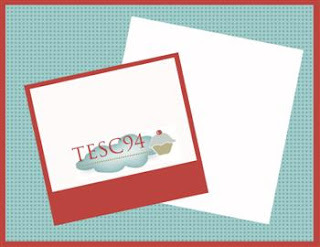 You can either write a sentiment in the pocket on the inside or even insert a little gift card there - I think I will do both :) Check out all the fabulous tag creations from the 2S4Y DT and then join in on the fun!!! 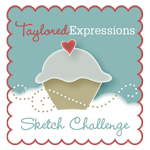 Can't wait to see your tagged creations! Thanks so much for stopping by this morning! December 20th Key Ingredients are Here!!!!! Its December 20th! and that means its time for a new release of Taylor's Key Ingredients kits! 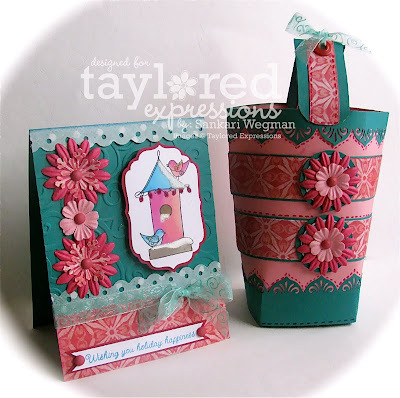 For those of you who are not familliar with these kits, every month, Taylor creates an awesome kit - full of Designer paper, coordinating cardstock, ribbon and embellishments - its such a great way to make cards and projects - because everything you need is in one kit and it all coordinates! Taylored Expressions is now offering a monthly charge prgram - so that menas that instead of paying for either the 3 month or 6 month option upfront, now there will be a charge every 15th of the month of their subscription - so for example the 6 month program is $14.95 a month plus shipping! Now that is alot of DP, cardstock and embellies all in one amazing kit! This December's Key Ingredient's are so versatile - they can be used for the holidays or birthdays, thank you's, congratulations, anything really! - and a package of Raspberry Candy Dots (which I had a HARD time resisting eating!!!! they look sooooo much like the candy dots that I grew up eating! and the are just the perfect embellies! Accessories: Ribbon and candy dots are from the Dec 20th KI kit, cuttlebug embossing folder, spellbinders, EK success punch, Cropadile and eyelets, Sakrua Glaze pens and Fiskars threading punch. 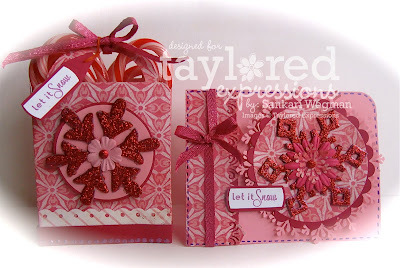 Here is closer look at the card - I just love all of the pinks and reds (its a very Legally Blonde kinda card - love that movie! :) and the snowflake is super glittery! Accessories: Ribbon and candy dots are from the Dec 20th KI kit, Cricut cut bag, spellbinders, EK success punch, Sakrua Glaze pens, corner chomper and Fiskars threading punch. After making these projects, I STILL have soooo much papers and ingredients leftover in the kit! 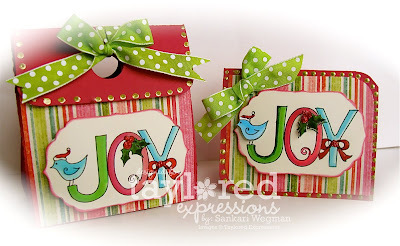 And I love the fact that these papers can be used for holiday projects but are also holiday neutral so can easily be used for bdays, thankyous etc! Check out all the amazinggggggg creations by these awesome Baker's from the Baker's Dozen! I know they have cooked up some beautiful holiday wonderness!!!! and of course - the amazing Taylor VanBruggen!!!! And for all of you on the East Coast - I hope you are staying warm and cozy in the winter's storm! 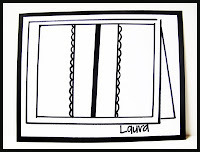 GinaK is now offering a CardKits that comes with a sketch and papers for the different stamp sets. 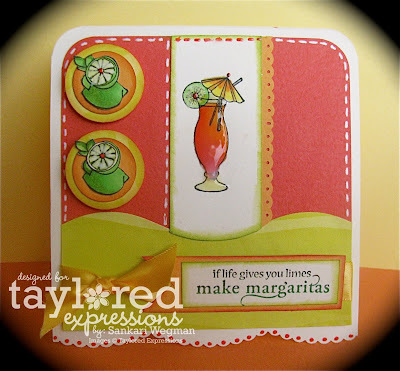 This card is based on the sketch that Jessica created with THIS card for the Tech Talk stamp set. I CASED Jess's card with the cute little coffee cups and changed the sentiment. 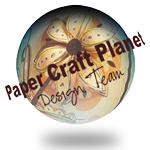 I love these sweet little mugs and they are the perfect size for paper piecing. I can't wait to give this to my coffee buddy :) the next time we meet up for a cup o' joe :). 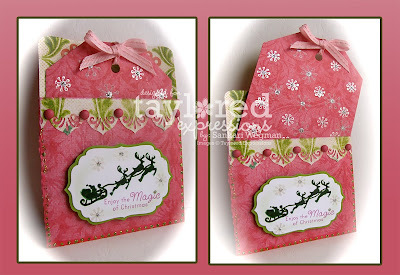 You can check out more about this card kit on this link on Jessica's blog or at Gina's store. Stamps: Tech Talk by Melanie Meunchinger for Gina K.
This is for my DH - who is a total computer nut! I used to joke with him that he was already married when we met......to his MAC computer! So I was so excited to make this Valentine's day card for him (I can't believe that I made a Vday card in December!!) 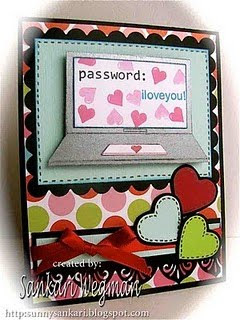 I stamped the computer image in metallic silver paper and then stamped the sentiments including the cute little heart stamp :). I matted everything in black for a more "manly" look (lol!) - I love all the different sentiments that are possible all on one screen! 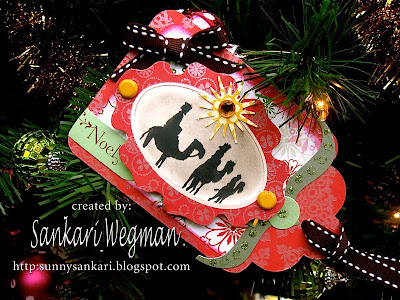 This next card is inspired by this awesome card by Melanie. I love how she created a little desk by splitting the image on a piece of DP. This one is for one of our uncles who is a little sick right now and so I was trying to make the card a bit more man-ish. 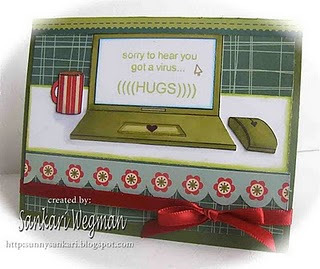 The sentiment: "Sorry to hear you got a virus" is so perfect for the little computer screen (and I would love it if my computer were an olive green color!). 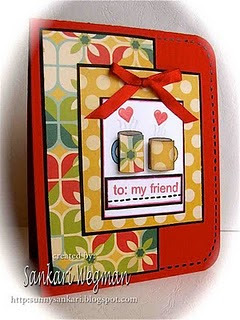 The mug is paper pieced and the scalloped edging is from the DP. The Tech Talk discussion on the StampTV Idea Center is a valuable resource filled with tips, sample projects, and tutorials. Melanie's tip sheet, free PDF template as well as the Card Kit is available in the discussion as well. 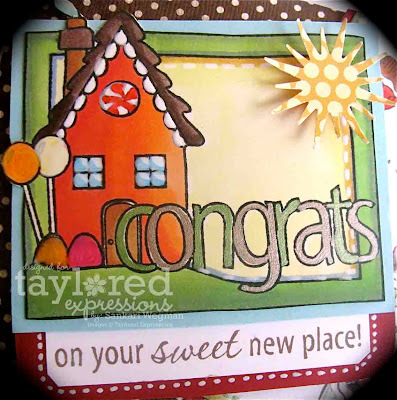 If you haven't already, stop by GinaK's blog today to leave your comment on her blog for your chance to win today's featured stamp set or any other stamp set valued at $23.95 of your choice! Thanks so much for stopping by tonight! Hope the start to your weekend is a beautiful one!!! And all of those of you on the East Coast - stay safe in the snowstorm! I don't know if you are feeling the holiday crunch - but things have definitely been busy in our household and I feel like a chicken running around, forgetting her lists of things to do and then adding more things on the list. I was in some major need of some stamp therapy last night and so I was so grateful that I had a chance to sit down at my craft corner and make some special things for my loved ones. I used Taylor's awesome sketch #94 for these projects. 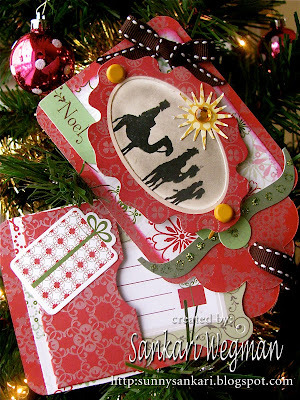 I loved the simplicity of this sketch and found that it was perfect for both a card and a scrapbook page. 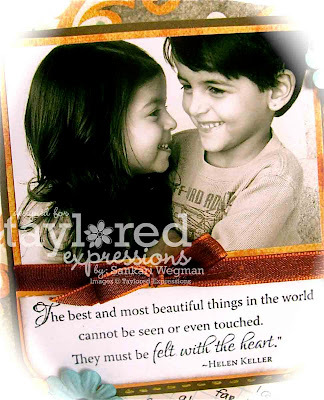 I got a little weepy making this page - I absolutely love love love this picture of my kids (and it always melts my heart when they are giving each other hugs and kisses and doing special things for each other - such a nice change from sibling rivalry!). I love this moment that I captured of them laughing together at a joke. And I love the quote from Helen Keller which is in the Discover Your Wings stamp set that simply describes this moment perfectly: " The best and most beautiful things in the world cannot be seen or even touched. They must be felt with the heart." To the dearest loves of my heart: "As I felt you grow inside, my heart was filled with gratitude and wonder, you both are the sweetest blessings, the apples of my eye. You are what makes me try to be the best mom I can be. Whether near or far, I am always with you - always loving you - always praying for you - always cheering you on. I feel our hearts are one. Always know that I am here - loving you!" It always amazes me how therapeutic it is to stamp and create something - especially when it is for those whom you love! I loved showing them this page this morning and I love displaying it in our house. I think that's one of my most favorite features of this calendar stand - that it can display your pages and they don't have to hide away in a book somewhere on the shelves :) Also, my kids LOVE pages about them! I think I want to paint the stand and decorate it up - but I am still filling it up right now - so I think I am going to wait till its all done and I can figure out what I want for a color scheme! 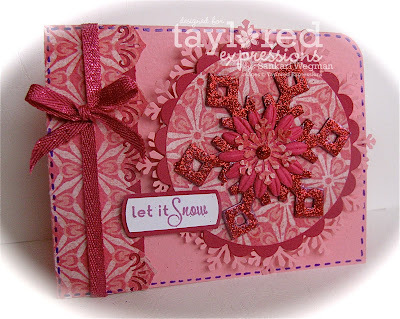 This next project is a card that I made using the Sweet Occasions stamp set that was Jami's orginal idea! My dear friends are having a housewarming party this weekend and I wanted to give them something special. 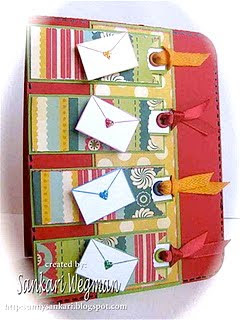 I love that this stamp set has so many multiple uses stamp set - it makes it so versatile! LOVE that!!! 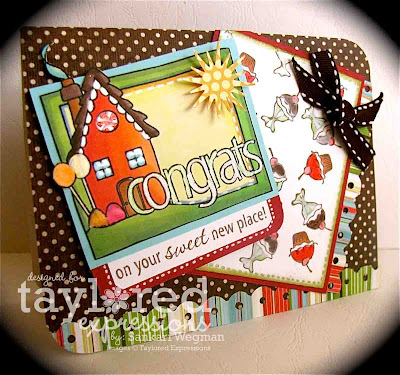 I used the congratulations stamp set with the cute house on it and then underneath I used the sentiment: on your sweet new home - and I LOVED that it fit perfectly underneath the house image! And my favorite part of the card was creating a little patterned paper out of the stamps in this set - like this mini cupcake or mini sundae set! So cute! I loved coloring them in! Accessories: Corner rounder, sponger, threading punch from Fiskars, dimensionals, ribbon from stash and tombow, Martha punch, sakura gel pens. I loved making these projects and feel so grateful for my family and my friends - both IRL and in blogland - you guys have no idea how much you mean to me - your support, love and sweetness always makes me feel not alone! Thank you for all of your sweet words! And thank you so much for letting me share this with you today! Sending each of lots of sunshine!!! 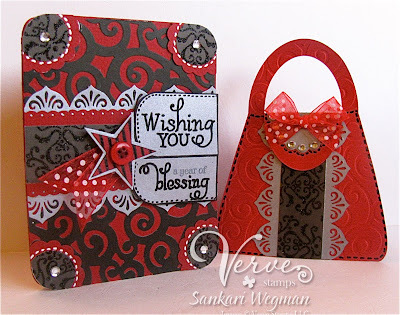 Please check out all the yumminess with the following amazingly talented ladies (Colleen, Bev, Suzanne and Valerie) as they showcase these different card kits and sketches! These ladies are amazingly talented and I can't wait to see all the yumminess that they have created!! Hope you are having a wonderful day! And a huge thank you to Jessica and Gina K for this amazing opportunity! You guys are simply the awesomest!!! Our day began with birthday cupcakes for breakfast and continued with birthday cupcakes at lunch --- and I have a feeling there are some more cupcakes in store for dinner! Stay tuned for the big hop on Friday!!! 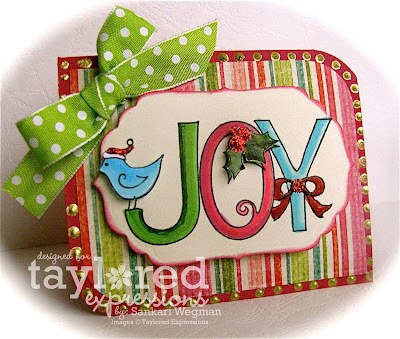 And in the meantime check out the awesomest Jessica Flick's blog iEmbellish for more details about this awesome new Card Kit Club from Gina K! 2 Sketches 4 You - Sketch #41 Happy Holidays! 2 Sketches 4 You - #41 - Merry Christmas! 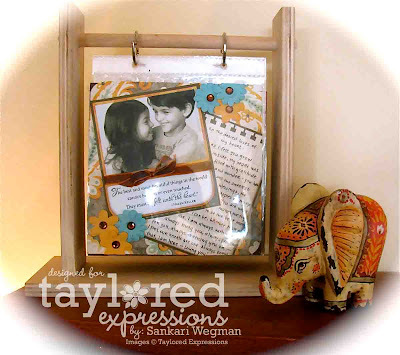 RELEASE DAY At Taylored Expressions!! !